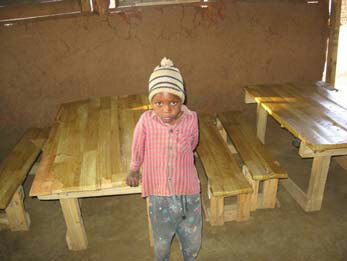 Matjana Preschool will reopen for the 2008 school year on Feb 6. We’ll welcome back five students from the 2007 class (who are not yet old enough for primary school) and 18 new kids will attend preschool for the first time. We’re also aiming to make significant improvements to the school’s infrastructure and increase its operating budget in 2008. Fundraising is our most important priority as it’s impossible to keep the school up and running, or improve it, without money. This year we hope to increase our operating budget substantially, raise some of the funds for our new classroom and develop a network of regular supporters. Through these activities we hope to raise E25,000 (US$3500) to cover our operating expenses and at least E10,000 (US$1500) towards the cost of building the new classroom. We’re also hoping to find a group of people willing to make regular financial contributions to the school (e.g. monthly or quarterly). The majority of our increased operating budget will go to covering higher living allowances for the local volunteer teachers, however we’ve also budgeted for staff training and development and additional expenditure on classroom consumables. We’ve decided to offer a living allowance of E400 per month to a second local volunteer teacher, to help Ncobile in the classroom (as Michelle will finish teaching at MPS in April and we haven’t yet found another international volunteer who’s able to self-fund). Ncobile will continue teaching at the school and take on extra managerial responsibilities. To reflect her commitment to date and the additional responsibilities she’s accepted, we’ve budgeted to increase her allowance to E800. Ncobile will also attend a training course run by the Ministry of Education - we don’t know the cost yet but have budgeted E3000 for this and other training and development activities. We think that developing the skills of local people and providing local work opportunities are extremely important aspects of this community development project, so we’re happy to be tripling our wage bill! Developing the school’s infrastructure is also an important part of the MPS project, but its very expensive. Raising the E50,000 (US$7000) that we’ll need for the classroom is a big task and we know we won’t be able to do it all this year. However, an American supporter who works in the micro-credit industry, has done some calculations and put forward a feasible proposal for funding the new classroom with a micro-credit loan. The estimated cost of repaying the loan over three years is E1500 (US$220) per month. We’re keen to take the loan but want to make sure we’re in a good position to repay it before we do so. In the meantime we want to make the best of our existing classroom. Brand new children’s desks and chairs have been ordered (at a cost of E2500) to replace the rickety home made ones we struggled through last year with. We’re also investigating the cost of teachers chairs and will soon purchase these for the MPS teachers for the first time (they used the kids benches last year). This will improve the classroom environment considerably. We’ve also replaced the old cow dung floor with a cement one (costing E400), which has cut down the dust levels considerably. "We eagerly await the day we get new Furniture"
The money we are raising is being well spent and allowing us to constantly make small improvements to the school. The success of our fundraising efforts this year will determine whether or not we’re able to make the biggest improvement of all– building a new classroom with the help of micro credit. To do this we need some money in the bank, but also to know that money will continue coming in. So we’ll be asking those who are able to, to commit to donating or raising money for the school in 2008, 2009 and 2010. Please let us know if you can help by donating money to, fundraising for or publicising MPS, now or in the future.